Over their 15-year career, Canada’s Great Lake Swimmers have crafted to perfection their version of folk informed chamber songs led throughout by Tony Dekker. While their last release, ‘A Forest of Arms’ added a more muscular beat to the songs than one expected from them ‘The Waves The Wake’ finds them back in a more ethereal mood. However, Dekker forsakes his usual style of acoustic guitar based writing for a set of songs featuring elaborate arrangements of instruments normally found in orchestral surroundings. 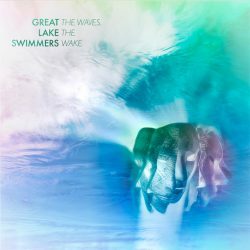 The sound is still recognisably that of The Swimmers with Dekker’s voice still prominent and there’s not too much of a sea change overall. Several songs still cleave to the earlier outings as on ‘In a Certain Light’ which has gentle banjo plucking and soft percussion while ‘Alone but not Alone’ and ‘Side Effects’ could easily have sat within the last album’s grooves. Indeed, aside from the opening song, ‘The Talking Wind’ which is wafted along on woodwind and pipe organ the first half of the album is merely more Great Lake Swimmers’ music. It’s on song number six, ‘The Real Work’ where Dekker really begins to delve into the sonic opportunities afforded by the expanded palette. Cello and piano are backed by nimble pizzicato strings as Dekker sings this wordy song poem which sounds portentous but which might make some sense to those willing to spend some time investigating the lyrics. The following ‘Root Systems’ is much more interesting as it opens with a clatter of percussive instruments which is followed by a rich string section and sinewy guitar offering a cinematic sweep to the song. ‘Unmaking the Bed’ is another adventurous arrangement with marimba and woodblock to the fore along with another powerful string section which is by turn quite stern in its woody evocations and then playful. The exotic percussion is revisited on ‘Holding Nothing Back’ which features Dekker’s voice multitracked to the nth degree. There’s also an acappela outing featuring his vocals, again multiplied, on ‘Visions of a Different World’ as he backs himself wordlessly on what seems to be a protest song. The backing voices here recall David Crosby’s debut solo album but overall the song is not as powerful or memorable as anything Crosby threw up in those days. The album closes with two songs which by and large abandon the sonic experimentation. ‘Mouth of Flames’ finds Dekker singing an apocalyptic song over a bedrock of glistening ambient guitars while the closing ‘The Open Sea’ opts instead for a rippling piano figure repeated throughout the song which eventually bursts open with crashing percussion and a billowing guitar solo. It steers a course initially which is very very similar to the opening motif of Mike Oldfields’ ‘Tubular Bells’ mind you. With the album recorded in a 150-year-old church one gets the sense that Dekker here is trying to break free from what might seem to him to be a formula. However, despite its dressings and adornments, the album doesn’t really break new ground and at times it does seem to over reach.